On 15 December 1889 at the battle of Colenso, South Africa, when so many horses had become casualties, Captain Reed brought three teams from his battery in an attempt to save the remaining guns. The shell and rifle fire was intense, and he was wounded almost at once, along with five of the 13 men who rode with him, one of whom was killed. Of the 21 horses, 13 (including his own) were killed before Captain Reed got half-way to the guns, and he was forced to retire. In 1904, he was promoted to Major and was wounded again during the First World War. He was mentioned in dispatches eight times. After the armistice, he was promoted to Major General and retired from the army in 1928. 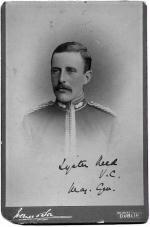 His Uncle, Harry Lyster, was awarded the VC in the Indian Mutiny, and is buried in Stubbing, in Berkshire.